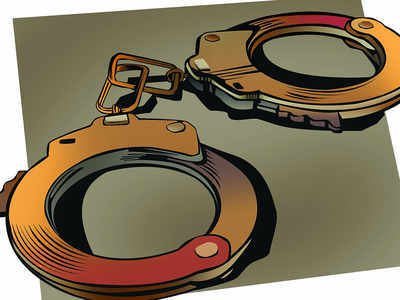 VISAKHAPATNAM: City cops arrested notorious burglar Kosaraju Narasimha Rao (42) and his wife Yendeti Ganga in Rajahmundry on Saturday and booked him for 48 offences in Vizag and East Godavari districts. The cops also recovered 605 grams of gold ornaments and a car from their possession. Ganga was arrested in January and 500 grams of gold ornaments were recovered from her. However, investigation is on to recover another 1 kg of gold from the couple. Addressing the media, deputy commissioner of police (crime wing) T Ravi Kumar Murthy said Narasimha Rao is a native of Pedavegi in West Godavari district and a school drop out. He came to Vizag in 2002 in search of livelihood and worked at a well-known club in the city. During his stay as a tenant in Ganga's house, he developed an affair with her after Ganga's second husband died. The couple began committing property offences and women trafficking to lead a lavish life. With the city cops slowly closing in on them, the accused settled in Kakinada and continued their offences.